Karen Wychock studied art extensively in college and originally focused my attention on woodworking and weaving on a loom. I was an art teacher for 22 years in the Neshaminy School District in Bucks County, PA before becoming a middle school principal for 15 years. 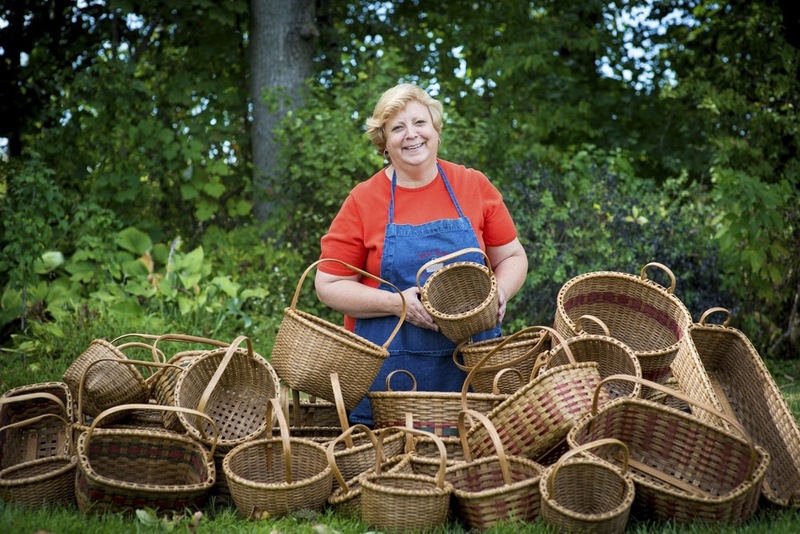 When I discovered basketry more than 35 years ago, I found my passion that artistically combined my love of weaving and woodworking. Working over wooden molds, in the method of the Shakers, my baskets are traditional in shape and materials. I weave both Shaker reproductions in ash and traditional, utilitarian baskets of reed. Native hardwoods such as ash and oak are used to make the rims and handles, and all of my baskets are lashed using ash. Each basket takes on its own character as it is woven in a quadrifoil, twill or fancy lace pattern to appeal to both eye and touch. I was president of the Penn-Jersey Basket Weavers Guild for six years. As a group, we offer our members classes, workshops, and trips centered around our passion for basketry. Times Gone By is my business name. I teach basketry in my home studio and at various locations across the Mid Atlantic region. I teach regularly at the Mennonite Heritage Center in Harleysville, PA. Most recently in March of 2017, I demonstrated and taught a class at the Mercer Museum in Doylestown, PA and at Washington Crossing Park in Washington Crossing, PA. I will also be teaching at Waterford, Virginia in July 2017. I also sell my work at various shows and galleries throughout the Mid Atlantic region (Pennsylvania, New Jersey, Connecticut, Virginia, and Ohio). Information on these shows and my workshops are listed on my website at www.karenwychock.com.